“Fretting” refers to the technique of pressing and holding the notes down so that they sustain properly. In this lesson, you will be guided step by step in how to do this so that all the notes you play ring out clearly. This is the first step in becoming a proficient guitarist and can take some time to really get down, so make sure you spend as much time with this lesson as needed. Make sure you’re tuned to standard tuning. Keep in mind that the fretboard is the flat wooden surface with the silver metal bars on it. The silver metal bars are called frets. Try to not bend the string when pressing it against the fret. All the notes you will play in this lesson are done on the sixth string, also known as the low E string. You will be using all the fingers on your fretting hand. The pinky, and ring finger might be a little tougher than the middle and index finger at first, but with enough practice, all your fingers will require an equal amount of pressure. It’s also important to note that you will be playing the notes from the 1st fret to the 8th fret. 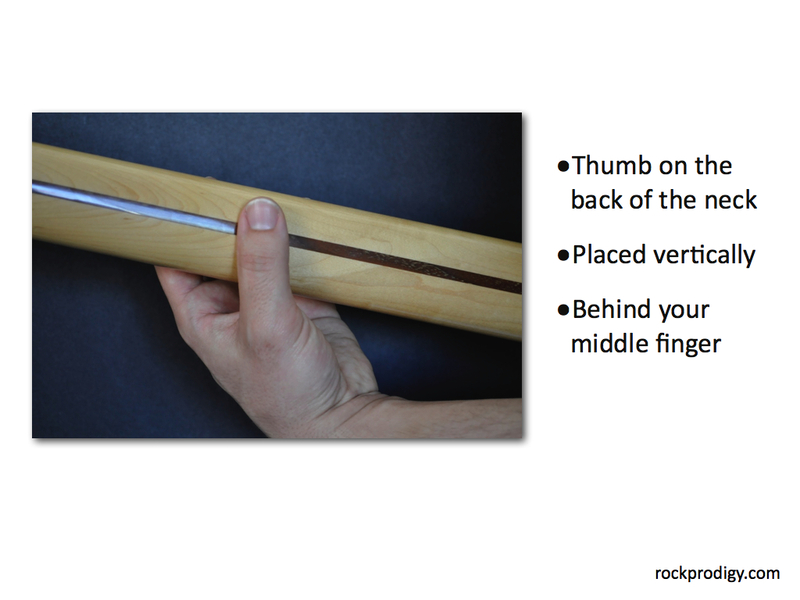 You will use all four of your fretting hand fingers in two positions of the neck. No open strings in this lesson. First let’s get our hand position in order. Let’s start on the thickest string, the 6th string E at the 5th fret. Ok, now let’s play some notes. Use your index finger to push the string onto the 1st fret. Your finger should be on the side of the fret closest to the tuning pegs. While holding your index finger down, pluck with your pick hand. Make sure you’re not pressing down with the padded part of your finger or the nail of your finger. You want to utilize the tip of your finger. Now use your middle finger to push the string onto the 2th fret. 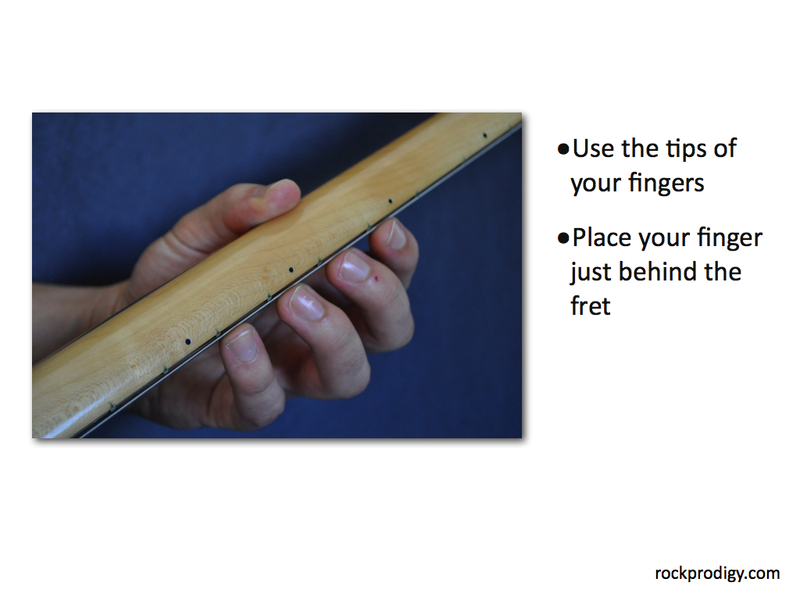 Your finger should be on the side of the fret closest to the headstock. Make sure you’re not pressing down with the padded part of your finger or the nail. You want to utilize the tip of your finger as often as possible. Let’s practice using our middle finger. Make sure you’re not bending the string. Now the Ring finger. On the 3rd Fret. Now use your pinky finger on the 4th fret. The Pinky finger can be a little hard at first, but just keep trying it and you’ll get used to it. If the note buzzes move your finger closer to the metal fret. Ok, now we’re going to shift up to the 5th fret. Use your index finger and press on the 5th fret. Try your best not to bend the string. Now use your middle finger to press the string onto the 6th fret. Use your ring finger to press the string onto the 7th fret. Remember to use the tip of your finger. Now press your pinky finger onto the 8th fret. For the final exercise, let’s combine and play all eight frets. Remember to shift your index finger when you get to the 5th fret. Start with your index finger on the 1st fret. Play the 2nd fret with your middle finger, the 3rd fret with your ring finger and the 4th fret with your pinky. Shift your index finger up to the 5th fret. Now your middle finger will be on the 6th fret, your ring finger on the 7th fret and your pinky finger on the 8th fret. 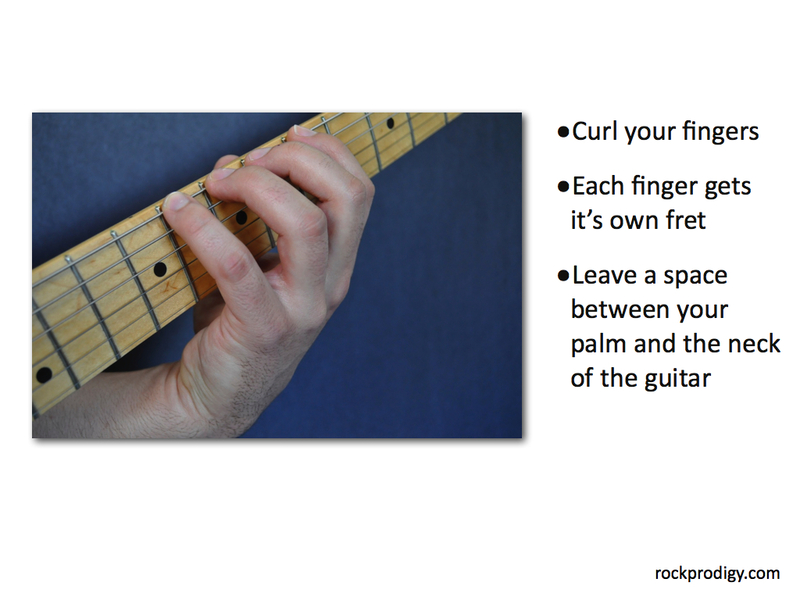 Try using this lesson a few times a day to get your hand used to pressing on the strings and frets. If it hurts a little bit, good, that means you’re practicing. In the exercises we expand on this by playing on the rest of the strings. Then in the second exercise we go up one string and down the next. 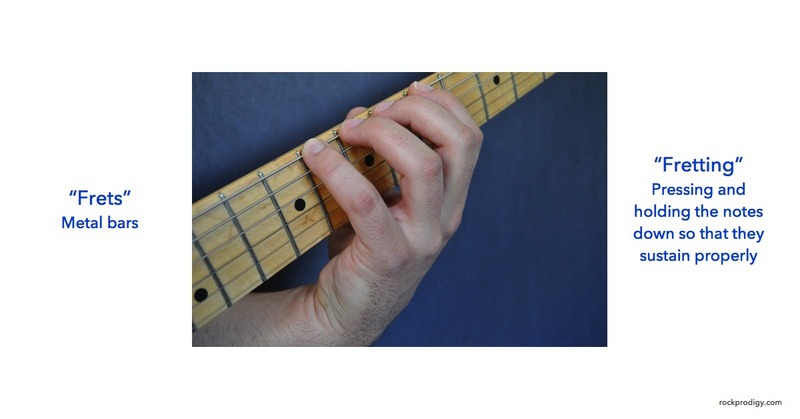 Then in the shifting positions exercise you will move up the neck one fret at a time every four notes. 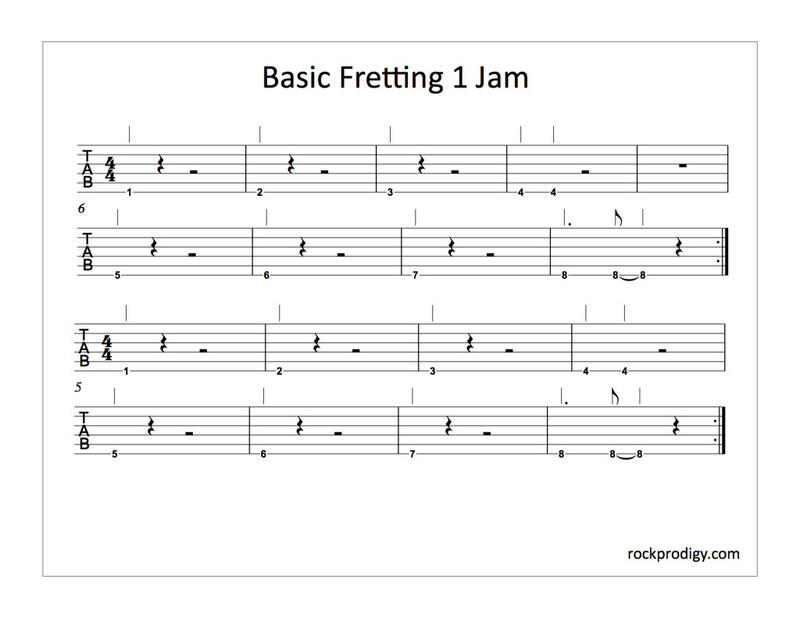 Have fun playing Basic Fretting 1 in Rock Prodigy. “Lesson 03: Basic Fretting 1″ lesson and music written and recorded by Mike Georgia for Rock Prodigy. ← Everybody, I mean everybody, has rhythm.